Warm Weather, is that you? It has been warm here in Louisville for two days in a row. I am hesitant to say that spring is here though, because Louisville weather is about as constant and well-mannered as Charlie Sheen right now. 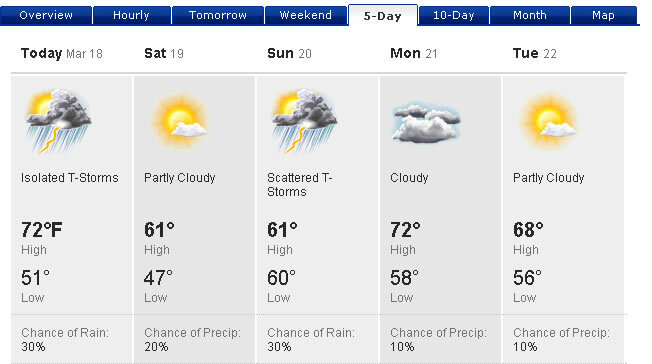 Here is our 5-day forecast from weather.com. I am cautiously optimistic about the advent of Spring, no matter what the groudhog says. Jen and I were able to take a walk yesterday and enjoy the sunshine and the English cottage architecture of our neighbors. Today after work we are traveling to the Volunteer State, which brings me much excitement. I’m excited about visiting with my family, and I’m excited about non-jacket weather. I am excited about spring and summer for many reasons of varying importance. One reason I am excited about it is the advent of slushy season. I don’t mean slushy season in terms of the slushy driving conditions caused by the inordinate amount of snow up here, but the kind of slushy that you drink for pure aesthetic (not health) value. My dad used to take me to get slushies after little league baseball games, or when we went to the putt-putt place in town. And although I know they are nothing but frozen water and syrup, I cannot resist the cherry ice (or coke ice) goodness. I prefer Icees, but I will partake from any slushy machine. The tradition here at For Aslan…and the Volunteer State is to do a poll every Friday. 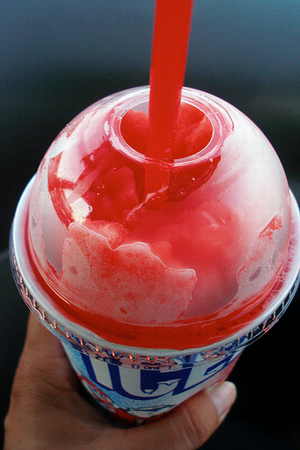 So, today’s poll is in honor of the slushy, the official beverage of 69°+ temperatures. I’ve only ever seen them in Target, but I particularly like the White Cherry slushies. All of delicious coolness without the embarrassing mouth stains. I hear you on the mouth stain thing, but – I guess for psychological reasons – the red wild cherry just tastes better to me. I am easily fooled by red dye I guess. never had a cherry coke one. i bet a vanilla coke one would be good too. « Who was this St. Patrick Guy Anyways?